Many of my available paintings are displayed on this website. Paintings can be seen in Halifax and in Bear River, NS. Made in the Maritimes Artisan Boutiques, Bedford and Hydrostone locations. 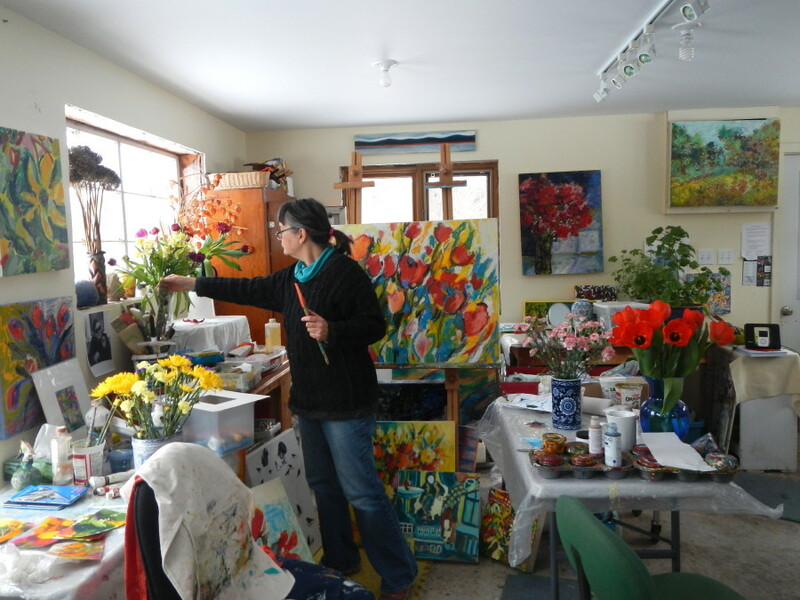 Flora’s Studio at 967 Riverview Road. Open by chance or appt. Bear River Artworks Gallery at 1913 Clementsvale Road, in the Oakdene Centre. Hwy 101 to exit 24. Drive 5 km along the river to the village stop sign. Turn right for Green Willow Studio (home studio), up Lansdowne Road two blocks to 967 Riverview Road. Turn right and we are the third driveway on the right. Turn left for The Flight of Fancy and Bear River Artworks Gallery. It’s difficult to get a sense of the size of a painting or its texture without additional photos. Please let me know if I can send you more. Paintings can be purchased through paypal, visa, or personal cheque if you live in Canada. I welcome payment plans. I am able to ship paintings to you, almost anywhere in the world. Just wanted to let you know that the links to the Art Gallery of Nova Scotia, art sales and rental, and the bear river gallery are not working for me. I was looking for your work on the Art Gallery site and couldn’t seem to find a link to your work either? Thank you so much for pointing that out Denise! I have updated my link to the former art sales and rental gallery (now the Teichert Gallery). They are updating their website. so their images of my work aren’t totally correct. However, I have linked all the work that I have at the Teichert in a link above. I have also linked to my listing of available paintings that I have here at home or that may be hanging at the Flight of Fancy. I will be uploading new images in the next few days. Thank you so much for your interest in my work Denise. If you haven’t already, please subscribe to my newsletter (sign up below) to find out about shows and new works.